1. In the Timeline view,right-click on the drawing layer and select Layer Properties or press [Shift] + [E]. You can also double-click on the layer, or click once and see the parameters in the Layer Properties view. ‣ You can also open the Layer Properties dialog box from the Network view by clicking on the module’s square yellow button. The drawing Layer Properties dialog box opens. 2. The Enable 3D check box displays the 3D parameters in the Layer Properties. Refer to Positioning the Scene Components to learn more about the 3D parameters and how to use them to position your element in the 3D space. 3. In the Position section, type in the desired value of the new element position. ‣ Select the Separate option to enable the edit of the different coordinate fields. ‣ Select the 3D Path option to enable the use of a 3D path function when animating your element. Refer to the Animation Paths chapter to learn more about 3D paths and Velocity. ‣ In the (x) Axis field, type in a new East/West coordinate corresponding to the desired position. ‣ In the (y) Axis field, type in a new North/South coordinate corresponding to the desired position. ‣ In the (z) Axis field, type in a new Forward/Backward coordinate corresponding to the desired position. Refer to the Creating a Multiplane topic to learn more about positioning layers on the Z-axis. ‣ The Function buttons are used to create function curves when animating. ‣ Separate: Resizes the element with independent X and Y scales. This allows you to squash and stretch. (x) Axis: Type in the horizontal scale value. (y) Axis: Type in the vertical scale value. ‣ Locked: Resizes the element while keeping its ratio. (xy) Axis: Type in the horizontal and vertical scales value. 5. 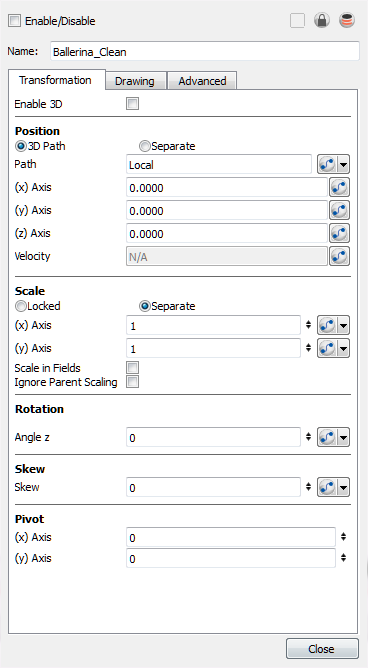 In the Angle Z field, type in a degree value between -360 to 360 for the rotation angle. 6. In the Skew field, type in a degree value between -90 to 90 for the skew angle. 7. In the Pivot section, type in the desired coordinate value to reposition the transformation pivot. This will change the permanent position of the pivot. As you type in the new values, the element’s position is updated in the Camera view. Refer to the Animation Paths chapter to learn more about function curves and animating elements on pegs.